With a pretty studio filled with home decor goodness from sofa sets to curtains and cushions, Living Urban is worth checking out to score some goodies for home sweet home or to get them customised to your liking. On the second floor, atop the TVS showroom in Kalyan Nagar, Living Urban grabbed our attention with its pretty drapes and sofas we could spot from the road through their big glass windows. We made our way in to find a decor hotspot with racks of curtains in different colours and patterns, rows of cushions, and plush couches and sofas. Speaking of sofas, we’re liking their collection that comes in a tasteful palette of colours, from mustards to deep blues. Turn up the quirk quotient by piling on some of their fluffy cushions with fun floral and leafy prints for a pop of cute. If you’re one to keep things simple, they have couches in classic browns and greys too. The prices start at a reasonable INR 52,000, so take the plunge. Although they have readymade pieces on display that you can buy, these guys focus more on customisations, so you can get one made to your specifications if you like a particular design. They also customise beds. Coming back to the aforementioned rows of curtains and drapes, the selection here is quite impressive. From sheer ones in creams and pastels with light patterns on them to ones in bolder colours and designs, you should be able to find something that suits your preferences and budget as the prices start at INR 450 per metre. 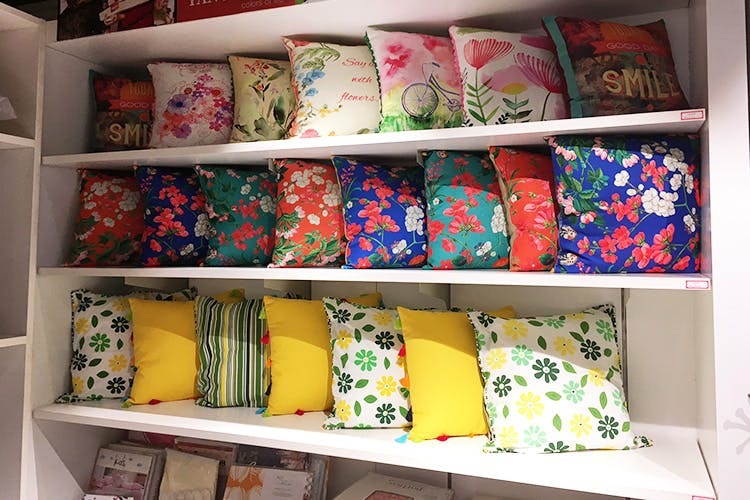 Other decor products include their throw cushions, priced at INR 700 for a set of two and wallpaper at INR 5,500 a roll. Their decor is customisable too, so go ahead and get creative. They keep having offers in-store (right now there’s a 60% discount on sofas), so keep a watch out for them!